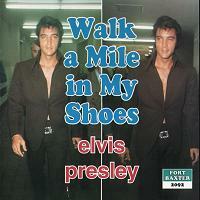 For both sentimental and artistic reasons I consider this one a favorite among the many 'private' releases of Elvis. As critic Dave Marsh noticed, the recordings that made up the fabulous 'February 1970-On Stage' albums comes from one of Elvis's very high peaks, and 'Walk A Mile In My Shoes' gives us even more from where that one came from, his second Las Vegas engagement. The cover states that the album was recorded at the 8:00 PM show on February the 1st, but other sources claims that this is in fact the opening show from January the 26th. But never mind that, this is an album featuring Elvis at his best, in rare form strutting his stuff in front of his adoring fans. The intro, with Elvis shaking the microphone in James Brown fashion(according to eyewitness Albert Goldman)in tune to a somewhat ragged, yet great version of 'All Shook Up' sounds great, and the version of 'That's All Right' that follows it is even better. Little Richard's classic rocker 'Long Tall Sally' is delivered in an explosive version with a fantastic guitar solo from James Burton, and it comes as a revelation to hear the medley of 'Walk A Mile In My Shoes' combined with 'In The Ghetto'. I'm pretty sure I wasn't the only one wondering about the fade-out on the former as featured on the 'On Stage' album...Overall, 'Walk A Mile...' comes across as a fabulous album, the only shortcomings being the short playing time (less than 28 minutes)and the somewhat distorted sound (Elvis is W-A-A-A-Y up above his backing musicians). But, as I have stated, this is Elvis at his performing best, so the serious collector couldn't do without it. This was one of my first bootleg purchases with Elvis, and it's still one of my favorites. © Morgan Sjöberg from Malmö, Sweden.